(CNN) -- Climate-driven environmental changes could drastically affect the distribution of more than 1,000 species of commercial fish and shellfish around the world, scientists say. 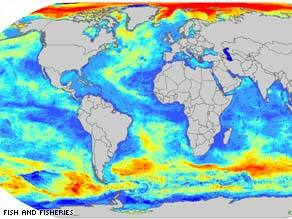 Red areas on this map show regions that are expected to have the greatest increase in fish populations by 2050. For the first time, researchers using computer models have been able to predict the effect that warming oceans, fed by greenhouse-gas emissions, could have on marine biodiversity on a global scale. A new study predicts that by 2050, large numbers of marine species will migrate from tropical seas toward cooler waters -- specifically the Arctic and Southern Ocean -- at an average rate of 40 to 45 kilometers (about 25 to 28 miles) per decade. These migrations could lead to "numerous extinctions" of marine species outside the Arctic and Antarctic, especially in tropical waters, according to the study's projections. "These are major impacts that we are going to see within our lifetime and our children's lifetime," said William Cheung, lead author of the study, set to be published this week in the journal Fish and Fisheries. "Climate change provides us with a kick in the pants," added Cheung, a marine biologist and lecturer at the University of East Anglia in the United Kingdom. "We can't think about climate change and biodiversity without thinking about the impact it will have on people." Researchers from the University of East Anglia, Princeton University and the Sea Around Us Project at the University of British Columbia participated in the study. Using a combination of data from fisheries and computer models that can project the potential effects of climate change on biodiversity, researchers were able to make predictions on the migration patterns of different fish species under varying climate-change scenarios. The study predicts that within 41 years, the global distribution of marine species will shift 60 percent as more fish move toward cooler waters near the Earth's poles. "Even if we completely stop fishing, we will still see a big difference in 10 years," said Emily Pidgeon, senior technical adviser with the Regional Marine Strategies Department at Conservation International. The study suggests that conservationists will have to adapt their approach to a shifting marine environment. Added Pidgeon, "The goal posts are changing, so we need to re-think and re-tool the way we look at fishery management." The migration patterns outlined in the study would further diminish the coastal population of the Atlantic cod, a once-plentiful fish that was a staple of American and European diets for centuries. According to the study, the worldwide population of cod could be cut in half by 2050. "Cod disappearing from New England is not new, it has been a trend for the last 15 years, said Mark Kurlansky, author of the book "Cod: A Biography of the Fish that Changed the World." "It's interesting to see that there is something else besides overfishing that is causing a decline." The migration of certain fish species out of their natural habitats could cause food shortages for millions of people, especially in developing countries near the equator, who depend on local seafood as a staple of their diet, scientists say. "Catch will decline in countries along the tropics like Malaysia where the conditions are too hot, and high-latitude countries like Russian and Norway will win," said Daniel Pauly, director of the Fisheries Centre at the University of British Columbia in Vancouver, Canada. The migrations could have economic and political implications if fish eventually drift across boundaries into waters controlled by neighboring countries, he said. "If you have fruit trees in your garden, and all of a sudden they move to your neighbor's garden, you can't do anything about it," Pauly said. The study's authors wrote that they hope their findings "give policy makers, the scientific community and [the] public a picture of the potential scale of the problem." They cautioned, however, that because of the complexity and scale of the issue and the computer modeling used to study it, "the magnitude of our projections is uncertain." Cheung and other authors of the study were expected to discuss their findings this week at the annual meeting of the American Association for the Advancement of Science in Chicago, Illinois.